This was our 10 year anniversary trip, back to Maui where we got married. It's been a great 10 years! Trip to Kauai with some great friends. First trip with others and we all had a great time! This was our last camping trip before selling our camper. Out trip back to the Big Island of Hawaii. Saw friends and did a number of things we did not do on our first trip there. Actually saw a number of sunsets. Aloha! 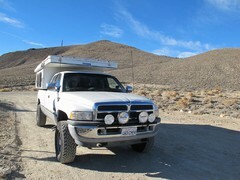 Trip to Saline Valley, South Pass and China Garden Springs. Perfect trip with perfect weather and perfect friends! Camping trip into Death Valley, Saline Valley and Scotty's Castle. Great trip with wonderful friends! Enjoy the pics! Camping trip in Valley of Fire, NV and our stay with great friends, Sarah, Paul and Kieran. We had a GREAT time all week!!! 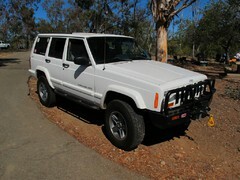 Trip out to Chuckawalla area and then down to the Colorado river. Great weather, nice scenery and even Ellie had a good time. 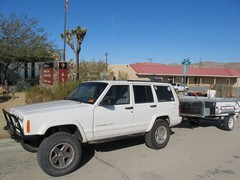 This trip was organized by Adventureduo on ExPo, to transverse from the Mexican border in AZ to Pismo Beach in CA. I was on 3 legs of a 10 leg trip. A 1000 mile trip with 850+ being dirt roads and trails. The part I was on was epic! Enjoy! A great turnout for the ExPo Toys for Tots event. Hosted at Camp Pentalton Marine base, it was a great venue. Huge amounts of toys were donated and lots of cool rigs a great people. Glad we were part of it. 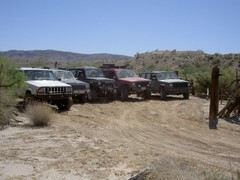 This was a trip out to the Bradshaw trail area. 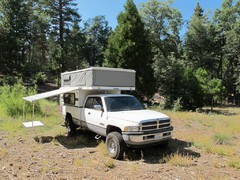 We found a great camp spot up in Corn Springs. We cut the trip short by one night as the wind had really picked up and that makes things unpleasant. Ellie had a great time!!! 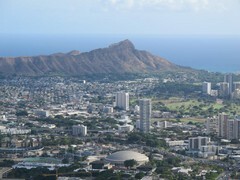 First trip to Oahu, Hawaii. Had a fun time, great weather and met up with friends while there. 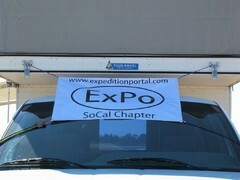 ExPo Mountain Rendezvous in Big Bear, CA. We stayed at the Boy Scouts camp which ended up being a great location for this venue. 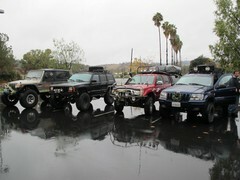 Weather was great, great people and lots of cool rigs! 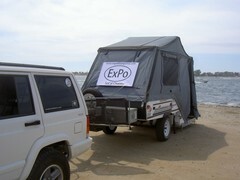 This was the second ExPo Meet and Greet held at Fiesta Island. Had a great turn out and lots of new members. Great weather, it was a perfect afternoon. Land Speed Racing at El Mirage dry lake. Mark Lintner broke his old record of 170mph by running 184mph! It was an awesome time and glad I was there to see it. 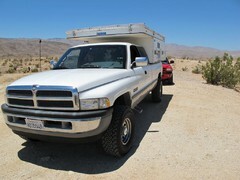 This was our first shakedown trip for our new Ram truck and Four Wheel Camper (FWC). Parents tried out our Kamparoo too. Overall things went well, we all had a good time and made it home safe. With better weather than 2009, we had a great turn out for the ExPo Toys for Tots drive. A ton of rigs and people showed up and in total, over 200 toys were donated! Great time was had!!! 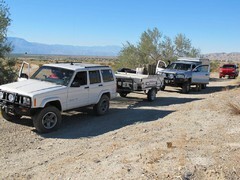 Our 2010 Thanksgiving trip, we tackled the Bradshaw trail, east of the Salton Sea. It was a fun trip, some cool trails and the coldest trip yet, at 22 degrees the first night. Burrrrr!!!! Enjoy the pics. This ExPo meet and greet was held at Miramar Lake this year as the thunder boat races were being held at Fiesta Island. We had a good turnout of about 20 rigs and it was nice meeting new faces and spending time with old friends. Held south of Green Valley, AZ, Overland Expo was an event that showcased overland equipment, held classes and seminars and brought the overland community together. It was great to see old friends and put faces to online screen names from the ExPo forum. We had a great time! 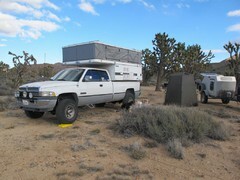 Friends from ExPo invited us to join them on a overnight trip to Joshua Tree NP. 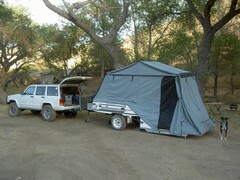 We camped at Berdoo Canyon. The company and weather were great and we had a fun time. 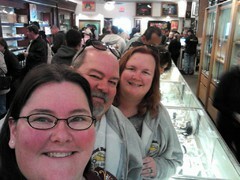 Met up with some great friends from ExPo for our second trip to Death Valley. We all had a great time and saw some incredible places. Weather was perfect though really cold the second night (27*). Burrrrrr. Can't wait for our next trip. There is so much to see in Death Valley. This was the ExPo Toys for Tots Christmas meet and despite the rain and bad weather, we had a good turn out. Dave and Yoshi did a great job on setting up this meet and over 100 toys were donated. Great job by all. A group from ExPo joined Lisa and I on our first Death Valley trip. Man was it fun. It truly is an amazing place and we are already looking forward to many return trips. The trip was cut short by a day due to nasty weather, including snow. Weird to see snow when in the desert. It was great to make new friends. 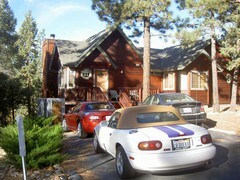 This was the 2nd year we did the Big Bear Octoberfest with the San Diego Miata Club. It was a nice, relaxing weekend. We did the Alpine Slide and Miniature Golf and had some wonderful massages. It was a great weekend. 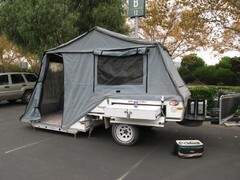 This trip was the first overnight camping trip with Ellie, our dog. 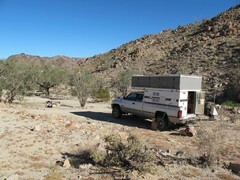 We did the Oriflamme Canyon and Blair Valley areas. 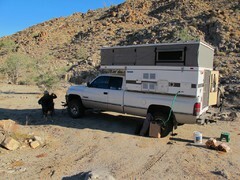 We camped at a nice little spot at the bottom of Oriflamme canyon. Overall Ellie did very well for her first time out. Fun weekend away from it all. 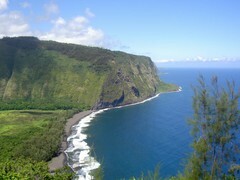 This is our trip to the Big Island of Hawaii. 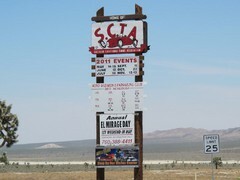 We had a great time but put on over 1100 miles of driving over the week we were there. It truly is the Big Island. This was an ExPo run to the In-Ko-Pah mountains. It was a great day with nice people. It was also a benefit run for Agent Rosas of the Border Patrol, who was killed in the area. This was the Meet and Greet at Fiesta Island for the Expedition Portal group. 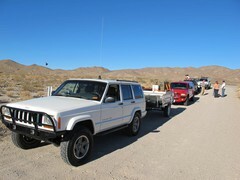 We had a great turn out, lots of cool rigs and great people. Tons of food and the weather was great, considering it was about the hottest weekend of the year, to date. This was our first trip offroading with our dog, Ellie. She did great. We visited the mud caves, Diablo dropoff, the marshes and Palm Spring. It was a great day and we had a very tired girl by the time we got home.